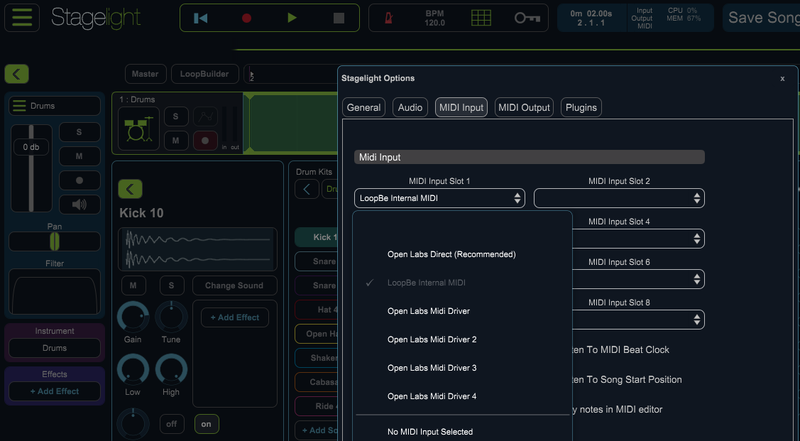 You can configure up to 8 Midi Devices (controllers and keyboards) in Stagelight. To active your midi controllers, go to Menu > Options > Midi Input. When you add an instrument track you will be able to play the instrument from any midi device that you have added. You can also press the track I/O button on your instrument track and choose a single device that will play the instrument on your track. then move the a knob on you midi controller. Thanks a lot, Ramon!. It works but sometimes few sliders work uncorrect. When you say they work incorrectly, what functionality is not working properly?